Internet sources say Cookie Crisp cereal came out in 1971, but they must have had a publicity blitz much later, because I remember discovering it and thinking it was new to the world sometime around 1980. What a treat! It was little COOKIES in a bowl. You could get away with eating cookies for breakfast! I remember the original, chocolate chip. But apparently there were also vanilla wafer, oatmeal cookie, and possibly a double chocolate version. The Wikipedia entry says Cookie Crisp was banned in Canada until 2009 because it promoted the idea of eating cookies for breakfast. Can this be true? Oh, my Canadian friends, you were missing out big-time. 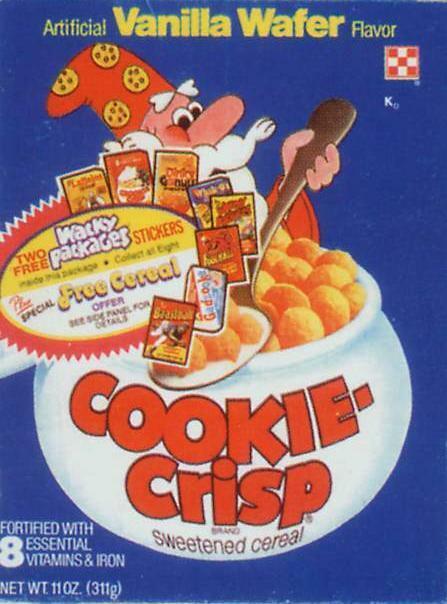 Cookie Crisp had a wizard mascot, Cookie Jarvis (is "Jarvis" a traditional wizard name? ), and then there was the Cookie Crook and his dog, Chip, who were chased by the Cookie Cop. According to Wikipedia, the NBC show "Community" had a great joke about that fact. Says Wikipedia: "In an April Fools' Day prank, Pierce is tricked into wearing a wizard costume with a cookie wand. One character mockingly calls him "Cookie Crisp." Later in the episode, one of the younger characters, Troy, admits to not really getting the joke because the mascot for Cookie Crisp was a burglar when he was a kid, not a wizard. He says he pretended to get the joke to impress the "cooler" character, Jeff Winger, who is in his mid-thirties." If I had to guess, I'd say a lot of moms and dads out there refused to buy Cookie Crisp because it was so bluntly bad for you. Thankfully, my mom did not care. Did yours? Do you remember Cookie Crisp, especially any of the oddball flavors? OATMEAL? I think you are right about the later publicity blitz. I don't remember much about it until around that time, too. I do remember begging my mom for it. A lot. Finally she relented and bought it for me and I hated it. I don;t know why, maybe I built it up too big in my head, but it just didn't do it for me. So I went back to my usual Cocoa Pebbles. Cookie Crisp was definitely around in the 1970s, although 1971 seems early to me, too. I definitely remember eating it as a kid, but more like around 1974-75, when I was 11-12, not as young as 8. Don't recall any of the flavors other than the original chocolate chip. I remember being extremely disappointed when I tried it because it didn't think it tasted like cookies at all! Yes! I loved Vanilla Wafer! It was my favorite. I saw the "Community" episode -- it was indeed a full-on tribute to Cookie Crisp. If you haven't checked it out, I'd suggest giving it a shot. This is the same show that recently referred to Molly Ringwald as "Molly Ringworm." "Community" = pop-culture awesome. My sister and I would beg for it, but we were never allowed to have it. I think I was in high school when I finally tried it. I didn't like it! So sad. I bet my little kid self would have loved it! OMG, I just realized that our Canadian government RUINED my childhood! I loved this cereal (circa 1975-ish) and was devastated when my mother could no longer find this. I hated most other cereal, except oatmeal - I love oatmeal with some brown sugar or maple syrup in winter. Now, it seems somewhat ruined - the wizard is gone, replaced by a weird red wolf/dog?! I don't get it! This is so awesome, I just won a bet with my wife proving that there were vanilla wafer cookie crisp. She claims that she never seen them before and realized that she loved chocolate and chose to ignore vanilla. FYI... there is also a sprinkled version cookie crisp that was available during the holidays (seasonal).